Click the "Order" button to add this item to the Shopping Basket. The product quantity can be adjusted in your Shopping Basket at any time. 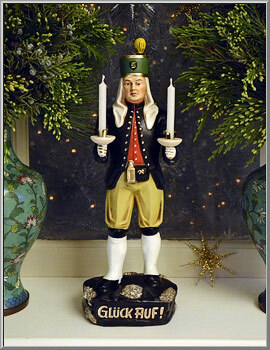 A traditional Christmas decoration with a long history, this 'Lichterbergmann' has its roots in the Erzgebirge, or "Ore Mountains" of Eastern Germany. 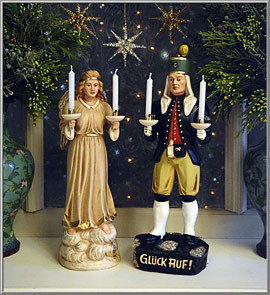 During the Advent season it was the custom for families to display, in a window, a miner candle holder figure for each boy, and an angel candle holder figure for each girl in their home. An impressive Christmas collectible that has the look of an antique piece, this large papier-mâché figurine is finely handcrafted by a family-run company that was founded in 1900. Our import from the manufacturer in Germany, the gift boxed miner comes with two white candles. Miner is 12¼" high.